WHO I FISHED WITH: This past Monday morning, January 28th, I fished with Mr. Dave Hill, a U.S. Army Vietnam veteran, and two buddies of his, George Godfrey from east of Austin, and Barrie Welch, originally from South Africa, who now resides in Ontario, Canada, near the Bay of Quinte. Dave has, since 2009, been leading the charge for the Austin Fly Fishers fund-raising efforts to support the Soldiers’ Kids Involved in Fishing Fun (SKIFF) program, along with Mr. Manuel Pena. But, today was Dave’s day to bend a rod, and that is exactly what we did. NOTE: In fairness, despite my blog entry title, not once did Barrie say “eh”. 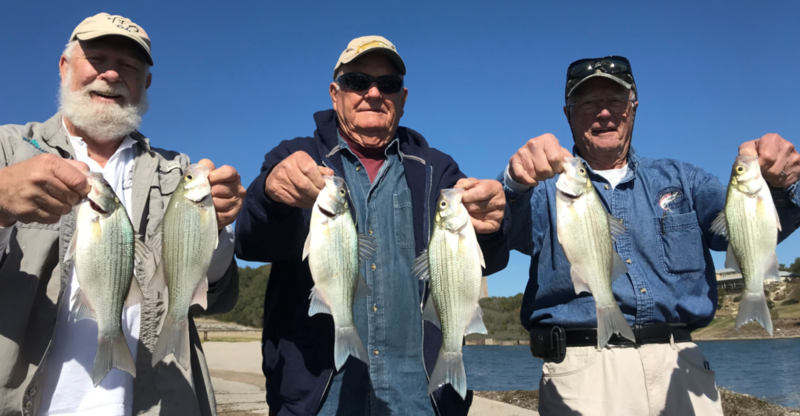 From left: Dave Hill, George Godfrey, and Barrie Welch with a sampling of the white bass action from today’s trip. Take a look at that bluebird sky; that always means tough fishing, but, thanks to their experience level and willingness to be coached, we missed very few bites and pulled out a good sack this morning. HOW WE FISHED: Today’s weather indicated average or below-average fishing in that we had bright, nearly cloud-free skies and a light breeze. The early going was slow, but, as the breeze built, the fishing improved right up to around 10:30, when it began to drop off once again, as it often does on days with such weather. Nearly 100% of the 107 fish we landed today came via snap-jigging, save for a handful of fish taken right around 9am when the school of fish we had teased up below the boat were active and joined by a new school of fish that moved into the area. During this short span (maybe 12 minutes or so) we were able to use a slightly more aggressive easing tactic, but went right back to snap-jigging after that flurry ended. We fished 5 distinct locations and caught fish at the middle 3 stops, stopping just once at the first two of these productive areas in 32-36 feet, and taking 2 short hops at the last productive location in about 48-50 feet of water. The diminutive 3/8 oz. white Hazy Eye Slab with Hazy Eye Stinger Hook did the trick all morning long. We landed 2 largemouth, 1 short hybrid, approx. 15 drum, with the balance of our 107 fish consisting of white bass. We hit 100 fish by 10:40a, then put just another 7 in the boat between that time and our wrap-up at 11:30a after the bite had fully run its course. OBSERVATIONS: No helpful bird activity this morning. Wind Speed & Direction: Winds were SSE3 at trip’s start, slowly building to SSE7-8, then tapering back down around 10:30. Sky Conditions: The wispiest of white cloud cover at about 30% on a blue sky.